Taylor Swift is a pop musician, singer and songwriter. Born to wealthy parents in Pennsylvania, as a youth she performed at shopping malls. At age 16 she signed a contract with Big Machine Records, the country label owned by Scott Borchetta and Toby Keith. 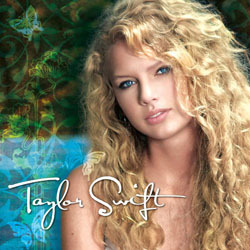 Her first single, released in June 2006, is oddly named after another country musician, Tim McGraw. It was followed by her self-titled debut in October of that year, entering the Billboard 200 at #19. It stayed on that chart for more than three years. In November 2008 a second album, Fearless, debuted at #1 on the Billboard 200, with seven of its singles immediately appearing in the Billboard 100. Fearless won Album of the Year at the Country Music Awards. She has since crossed over to mainstream pop music, producing the dubstep-influenced pop rock I Knew You Were Trouble (2012). Unexpected attention came at the 2009 MTV Video Music Awards. The winner of best female video for "You Belong with Me", she had held the award only a few moments before rapper Kanye West rushed onstage and seized the microphone, claiming that Beyonce Knowles' video, was "one of the best videos of all time", the implication being: we was robbed. Kanye was ejected from the ceremony, and when Beyonce won an award later, she graciously turned the stage over to Swift. Reaction to the incident was harsh, with even President Barack Obama weighing in, calling Kanye West a "jackass" in off-the-record remarks. The rapper had simultaneously done himself a great disservice, and given Swift the greatest gift of all -- mountains of favorable publicity.